When an overflow or underflow of the Counter occurs, the MAX/MIN output, which is low during counting, goes high and remains high for one Clock cycle. This output CAN be used for look-ahead carry in high-speed cascading (see Figure 1). 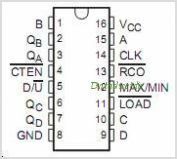 The MAX/MIN output also initiates the ripple Clock (RCO) output, which is normally high, goes low and remains low for the low-level portion of the Clock pulse. These Counters CAN be cascaded using RCO (see Figure 2). This is one package pinout of CD74HC191,If you need more pinouts please download CD74HC191's pdf datasheet. CD74HC191 circuits will be updated soon..., now you can download the pdf datasheet to check the circuits!